One of t-codes that enable showing of cube data in SAP BW system is LISTCUBE (report RSDD_SHOW_ICUBE). It is foreseen to be a central tool for analyzing raw data in infoproviders and problems with data in there. The tool is also used by SAP support organization while solving customer’s issues. As usually custom infoproviders are pretty complex it is not easy to prepare example of data where issue is related to for SAP support. However the LISTCUBE tool can be leveraged in a way that pretty straightforward examples can be created for the support team. Below is procedure how to prepare it. 1. 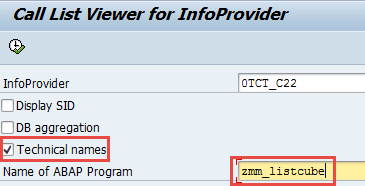 On the LISTCUBE selection screen just a check box called “Technical names” needs to be ticked off and some Z* custom ABAP report name needs to be specified in field “Name of ABAP Program”. 2. Next screen is displayed in case there are many characteristics and key figures within the infoprovider whose data shall be displayed. The screen is only displayed in case a number of objects exceed limit of ALV output. Furthermore it is possible to save a list of selected fields in a text file on your PC or to import changed field lists from the PC. The file is basically used to limit no of objects. E.g. only objects that are needed will be stored into the file and the file will be used in next analysis of the issue. 3. Create a variant of fields that need to be restricted on the selection screen of particular infoprovider. Later on the variant can be used by SAP Support team. By following this procedure a new custom Z* report that was specified in step no 1 will be created for the infoprovider. When the SAP Support team logs into the system they just simply run the new custom Z* report and they also use the variant with restrictions of data that was also created. All of these will speed up processing of the issue either by SAP support or within local support team in case more person are working on the issue.